Work with asylum seekers being held in U.S. custody and learn of the many legal and practical challenges they face. Orientation and training will be offered. 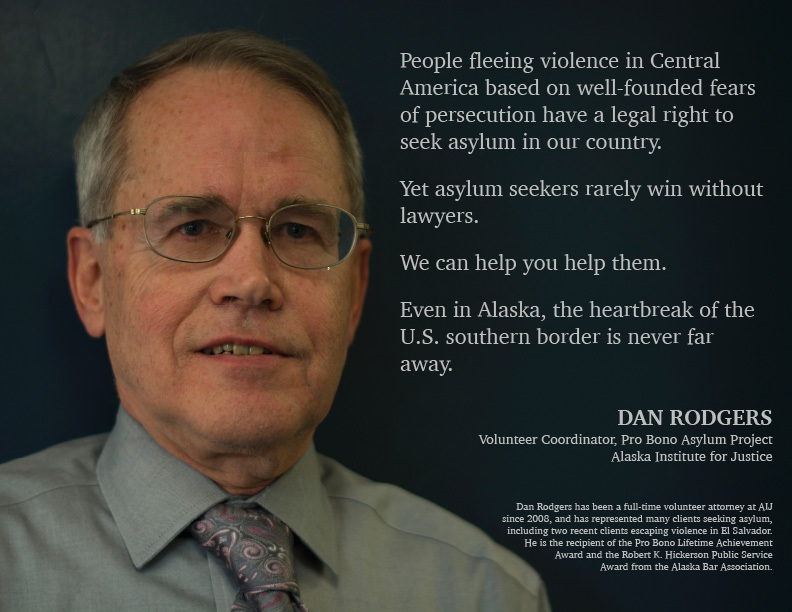 An ongoing effort to provide legal representation to asylum seekers in Alaska. No prior asylum experience necessary. Training and ongoing mentoring provided. Volunteer service to either project applies towards the 50-hour aspirational goal for pro bono service established under the Alaska Rules of Professional Conduct. No time to volunteer? Donations are much-needed and gratefully accepted! The purpose of the Language Access Plan (LAP) is to provide guidance to AIJ staff to ensure equal access to the services provided by the Alaska Institute for Justice for LEP individuals and individuals who are deaf or hard-of-hearing. AIJ provides language access for LEP individuals and individuals who are deaf or hard-of-hearing because AIJ’s mission is to protect and promote the human rights of all Alaskans. AIJ’s Language Access Plan is a critical component of this mission and ensures that all Alaskans have access to the services provided by AIJ. AIJ also receives federal funding and must ensure compliance with Title VI of the Civil Rights Act of 1964 which prohibits discrimination on the basis of race, color, or national origin. National origin discrimination includes not providing services to LEP people. 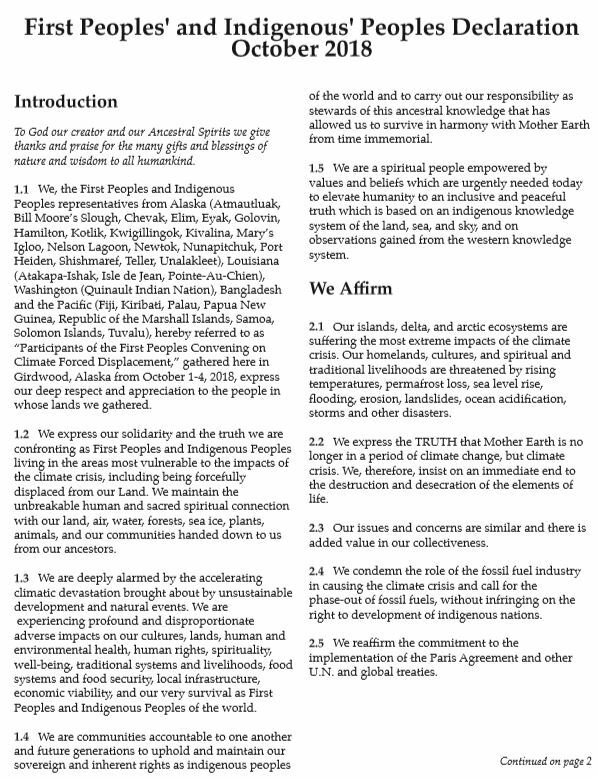 GIRDWOOD, AK—More than 60 community leaders and advocates from across the world will gather in Girdwood, Alaska for a three-day conference to discuss the devastating impacts of climate change and agree upon a shared advocacy platform to address climate-forced displacement. The Alaska contingent will represent 16 Alaska Native tribes. Others include civil society and community representatives from Bangladesh, several Pacific Island countries, and the states of Louisiana and Washington. Convening participants—most, if not all, of whom have experienced the impacts of climate change—will share experiences, build relationships, and develop strategies, including a shared declaration of principles that will guide future advocacy work. Cecilia Jimenez-Damary, Special Rapporteur on the Human Rights of Internally Displaced Persons for the United Nations Human Rights Office of the High Commissioner, is tentatively scheduled to participate in a special Skype session with attendees to discuss the impacts of climate-forced displacement. Fenton Lutunatabua, Pacific regional coordinator for 350.org, a grassroots environmental advocacy organization in the Pacific Islands, will attend the convening with a contingent of seven Pacific island countries. He said that convenings like this are a prime opportunity to build a strong coalition to attack a global problem. Climate change impacts fall into two broad categories: rapid events (tornadoes, hurricanes, and floods) and slow-onset events (melting permafrost, erosion, and rising sea levels). Since 2008, more than 25 million people have been displaced annually due to rapid climate change events; data on slow-onset events are much harder to quantify. Compounding the climate change threat is the lack of funding and governance frameworks to address relocation efforts or the costs associated with the loss and damage communities experience. An equally important concern is the marginalization of the voices of the communities most impacted, the majority of whom are Indigenous peoples. Throughout the world, UUSC and our partners advance human rights, dismantle systems of oppression, and uplift the inherent worth and dignity of all people through grassroots partnerships, leadership education, and advocacy. Language Interpreter Center Program Director, Barb Jacobs, co-authored an article recently published in the Annals of Family Medicine. This article provides an overview of the federal requirements related to providing interpreter services for non-English-speaking patients in outpatient practice. Antidiscrimination provisions in federal law require health programs and clinicians receiving federal financial assistance to take reasonable steps to provide meaningful access to individuals with limited English proficiency who are eligible for or likely to be encountered in their health programs or activities. A team of scientists presented data on Tuesday suggesting that even as the state of Alaska has warmed up extremely rapidly in recent years, snowfall in the iconic Denali National Park has increased dramatically during the era of human-driven global warming. 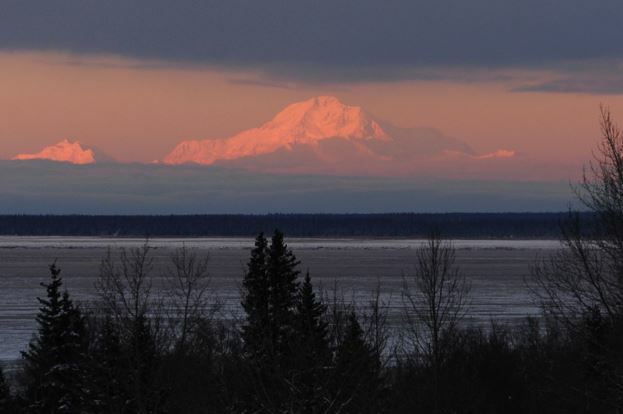 The researchers from Dartmouth College; the University of Maine, Orono and the University of New Hampshire set up a camp at 13,000 feet atop Mount Hunter, within view of Denali. There, they drilled into the snow to extract lengthy cores of ice that provided a historical record of snowfall patterns going back more than 1,000 years – and found a marked change over the past 150 years or so. Global warming is causing ocean water to become less like baking soda and more like milk, chemically speaking. It’s a phenomena called ocean acidification (OA) and it could have damaging effects for marine life. A bill announced week by U.S. Sen. Lisa Murkowski seeks to study the effects OA would have on coastal communities. The Coastal Communities Ocean Acidification Act of 2017 would direct the National Oceanic and Atmospheric Administration to assess the vulnerability coastal communities have to ocean acidification. It was introduced in the senate on Dec. 14 and announced in a release by Murkowski’s office on Tuesday. KONGIGANAK — On a crisp day in September, the village of Kongiganak, or Kong, filed into a little white church and laid Maggie Mary Otto to rest. The service was crowded. An elder and de facto marriage counselor, Otto was beloved. She was the kind of person who cooked steaming plates of walrus for her community every January for Russian Orthodox Christmas – even though she wasn’t Orthodox herself. After the viewing, Otto’s pallbearers carried her casket outside, placed it on a metal cart, and attached it to the back of a four-wheeler. 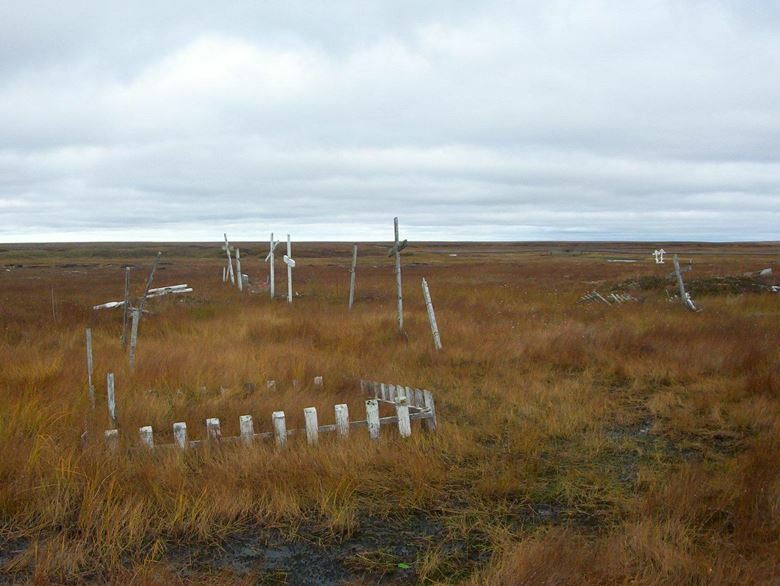 Kong’s cemetery is a 10-minute drive on a boardwalk over marshy tundra. A procession of four-wheelers followed the casket to a rust-colored hill and a smattering of chalk-white crosses. Rather than lowering Otto’s body into the ground, pallbearers placed her casket on a low wooden platform, raised about 6 inches above the ground on blocks. A half-dozen men lifted a white, wooden box and placed it over her casket to protect it from the elements, covering it completely. 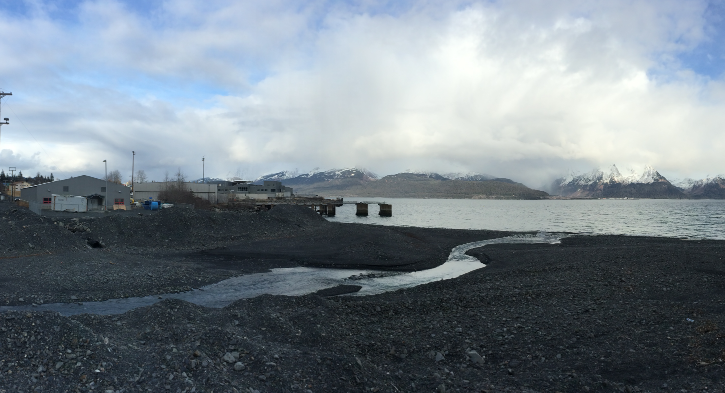 Port Heiden on the Alaska Peninsula is losing shoreline quickly. Wind and waves have pushed the coast inland by an average of about 30 feet this year. Areas along the road from Port Heiden to the safe harbor and old village site lost roughly 17 feet in November. At the end of the month, the village closed the road because it is no longer safe to drive. A crucial section of that road winds along a 12-foot bluff above the beach. It is a crust of dry land hemmed in by the bluff edge on one side and Goldfish Lake on the other. “The road is basically gone. 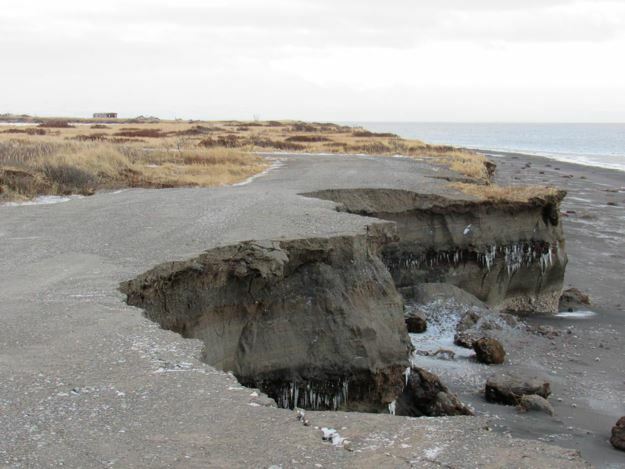 (Erosion)’s cut right half into the road,” said Scott Anderson, the Native Village pf Port Heiden’s tribal environmental director. Human rights are the moral fibers woven throughout humanity and remind us that we each deserve to live lives of dignity. The right to be free from hunger, the right to housing, the right to safe drinking water, and the right to an adequate standard of living constitute the foundation upon which freedom, justice, and peace can flourish. The Universal Declaration of Human Rights, adopted by the UN General Assembly in 1948, is the seminal document that articulates these inalienable rights to which all human beings are entitled. 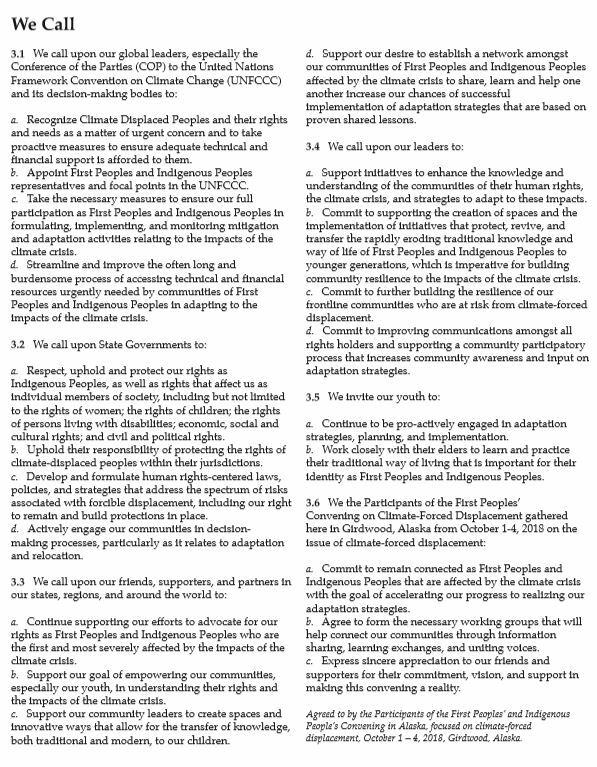 Since 1948, numerous international documents affirm the importance of human rights, including the International Covenant of Economic, Social and Cultural Rights and the Universal Declaration of the Rights of Indigenous Peoples. Governments do not bestow these rights upon us, but governments are required to promote, protect, and fulfill the human rights principles articulated in these documents. When human rights are violated, a tear occurs in our human tapestry and we must act to ensure that the violation stops and that rights are once again protected.